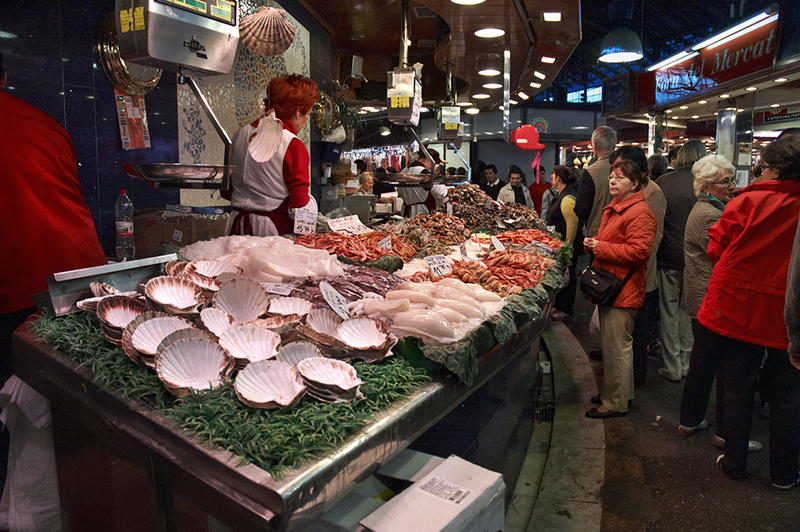 Yesterday, I went to La Boqueria market and took some more pictures. For those who were interested in images that were more on the report side and less on the artistic one here is a general view of a seafood stand. There are others with more fish but I thought you would like to see the shells and some people buying stuff. Once more, there's a contradiction here: my first impulse would be to show only those beautiful gigantic shells from a close distance but you want to see more of the market. I understand. Maybe a little bit of everything is better. When you capture all the scene then you start getting some noise, like a bottle, a box, people talking on the right, a man turning his back on us, etc. But then again this blog is meant to please you more than myself. If not it would be a monologue. This is rather fishy, though...and I wonder what you'd have to shell out for one of those shells? I had a pregunta ( question ) :) in barcelona,spain or just from what you know in spain Do they have apartments like they do here in america? or not so expensive ones?? and town homes?? Most of the time I've googled for apartments,houses, and town homes in spain they come out really expensive and look really crappy for the price :/ ?? I plan on moving sometime in the future and just wanted to gain as much knowledge from that type of stuff lol OH! and do they sell elotes with chile, mayonesa, and queso over there?? O_O!! -CheshireCat: Hmmmm, I think I am not too keen on the real estate business. Moving is possible indeed. And it is true that what u see online sometimes does not reflect reality. Rooms in pictures are neither as beautiful as they seem nor the price matches what u finally get in return. As a general thing, you should know that the market is not working fine with the world crisis and all the rest. There was a period when building companies, real estate agencies and private owners went crazy with prices and made a huge profit. The bubble exploded on them and anything related to mortgages, credits, buying or renting a house/apartment has gone completely wild. Maybe that affects the poor offer you get online. To find a good place to live you have to walk the streets and check for yourself on pros and cons. Prices are slowly going down, very slowly. I suppose in the future everything will be back to "normal" (you know when prices change, it is rare they get to be as low as they were) As to the food! Well, elotes or esquites are not sold on the street, not that I know of. Maybe in some of the many Mexican food restaurants in the city you might find them (¿?) Thanks for asking. It is an amazing place. I had a wonderful time when I have visited twice this spot of Barcelona! Just wanted to say how much I enjoy your work. My one and only visit (so far) to Barcelona in the Spring was a very important one for me, as my wife and I took it as the beginning of a reconciliation. We joined a friend and her sister (who lived in Barri Gotic district) and took in all of the wonderful sights and tastes of the city. Thanks for bringing that all back to me through your words and photos. I hope one day to return and do what you're doing, because I can sense the passion and appreciation in it. That is a good consideration. Thank you for putting that up there. Sometimes we have to give up that artistic photos for the photojournalism (?) style of photography. Well done. Love the lights and the people and of course the shells. Those are BIG.